While Florida law provides that condominium associations have the right to access all units in the condominium for maintenance and repairs to the common elements, many unit owners are often reluctant to provide a copy of the key to their unit to the association. Owners cite a variety of reasons for their unwillingness to provide the association with a copy of the key and allow access to the residence, but in reality there are no valid reasons for owners to avoid complying with this aspect of the state’s condominium laws. Florida law specifically provides that condominium associations have the irrevocable right of access to each unit during reasonable hours when it is necessary for the maintenance, repair or replacement of the common elements or any portion of the unit that the association is required to maintain, as well as to prevent damage to common elements. Most condo association governing documents also include language regarding the right to access the units and requiring owners to provide the association with a copy of the key to the residence for the association to keep. The most typical use of this right to access the residences is for projects involving work on the balconies and windows. Contractors require access to the units for these projects, and many times they also need to temporarily store the equipment that they are using for the work on private balconies and ground-floor terraces while the projects are underway. Unfortunately, even for these important renovation projects, there always seems to be at least one owner who attempts to refuse to comply or insists that the access or equipment storage be restricted in a manner that is not conducive to the completion of the work. 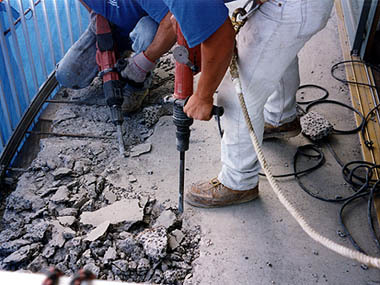 Many owners do not realize that the law states that the condo associations have this irrevocable right of access for these purposes, and if necessary the associations can file suit for injunctive relief to gain access to the units of recalcitrant owners and store some of the equipment as required for the work to be completed. For associations and property managers, it is important to bear in mind that they are not allowed to use the keys to gain access to residences unless it is specifically for these types of projects involving the common elements or to prevent damage to the common elements. For example, if there is a known leak and water is seeping through the walls or ceiling of the space below a residence, the association and management can access the unit to inspect the plumbing and repair the leak in order to prevent further damage. However, if the association simply suspects that there is a plumbing issue, such as a running toilet, but there is no evident leak or property damage, it is not allowed to just access the residence. Instead, the association should contact the unit owner to inquire about the plumbing issue and schedule a time to inspect the fixtures as necessary. Maintenance and repairs of toilets, faucets and other plumbing fixtures inside of the residences are generally the responsibility of the individual unit owners, so the association and management must work with the individual owners to address any such issues. Whenever possible, the association and property management should contact the unit owner in advance of using their right to access the unit. However, in cases involving property damage of an emergency nature, the association would be able to use the key to access the unit even without advance notice to the owner. It is imperative for associations to keep copies of the keys to all of the units in the building in a secure location with restricted access only for the property manager and/or specific board members. Condominium associations that do not have copies of keys to all of the residences in their buildings should consider adopting a rule requiring that the unit owners provide them with copies of the keys. Associations facing unit owners who refuse to provide a copy of the key or grant access to their unit as required by law should file a petition for arbitration with the Division of Condominiums to force the owners to comply. Because the law is very clear about this irrevocable right of access for condominium associations for the purposes described in this article, they are virtually guaranteed to prevail in these arbitrations. Filing a lawsuit against the owner for injunctive relief to access the residence is also possible for extreme cases in which the owner refuses to comply with the arbitration ruling.